Makeup has the power to make an ordinary face look beautiful in an instant. If you are a makeup person, you may have invested in application brushes that do the work for you. The contouring, the concealing and all that comes with properly done make up. You probably use different colour shades to achieve the best results. A mix of powder here, a liquid there, and you look ready for a wedding! While you concentrate on different types of makeup, how do you clean your brushes? Are you the type that neglects them? This is the simplest method. Investing in an excellent antibacterial soap should be your starting point. Apply it evenly on the brushes. Using your hands, rub the soap gently into the brushes and place them under a running tap or in a bowl of water. Squeeze them gently as you continue adding water. You can add some more soap if needed. If the brushes are greasy, warm water will do the trick. Continue the process until the water is clear. Part them dry with a clean and dry cloth. Leave them outdoors to dry. You may feel that the above method is not enough for your brushes. A silicon mat is your best bet. All you need is to slip the silicon mats onto your hands and rub the brushes. With their nubby surface, they will do an excellent job cleaning your brushes. You will still need an antibacterial soap or a gentle shampoo while doing this. Keep rubbing them with the silicon mats until you are certain they are free from any makeup and grease. Once done, thoroughly wash the mats with warm water and shampoo and store them in a clean and dry place for your next use. You can be sure baby shampoo is designed to work on delicate and sensitive skin. It’s specifically made for baby skin. Working with it on your brushes will leave them conditioned and clean, making them ready for your next makeup session. Due to its conditioning effect, the brushes will feel smooth on your skin, giving you a perfect makeup finish. These are formulated for cleaning makeup brushes, and you can get them in some beauty shops in Singapore. Their ingredients incorporate both baby shampoo and antibacterial soap, making them one of the best cleaning agents for your brushes. They lather quite fast making the whole process fast and easy. Once done, your brushes will have a clean, soft and conditioned finish. A hi-tech cleaning brush is another option you can explore. Though quite pricey, it’s a worthwhile investment for your makeup brushes. Most of these machines come with a soap reservoir. Therefore, you don’t need to apply the soap. Place the brushes in the slots of the machine with the bristles facing down, then turn on the machine – and it will do all the work for you. You may be lazy, but using brushes caked with powder and grease could easily trigger acne. 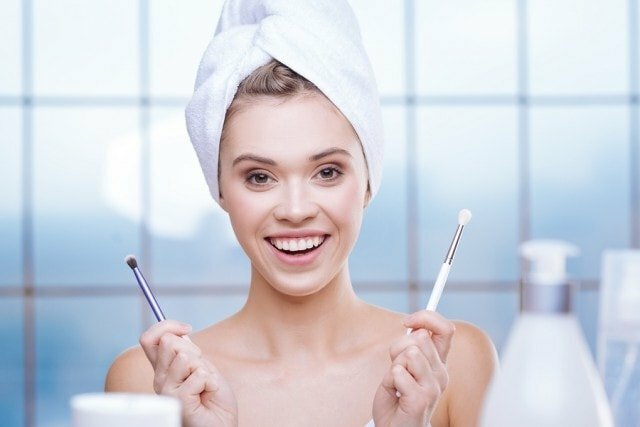 If your brushes are clean but you are still suffering from recurring acne, seek help from Singapore’s best facial treatment.